Do you need an additional water source from your T&S EasyInstall pre-rinse unit or mixing faucet? Finding it hard to install? The T&S solution – a B-TEE-RGD, designed for use with T&S pre-rinses, or a B-TEE-EZK, designed for use with T&S mixing faucets. Tees on pre-rinse units & mixing faucets are used to supply water to accessory applications such as chemical injectors (for cleaning jobs, etc.) They are not intended to introduce chemicals into the T&S pre-rinse unit or mixing faucet. 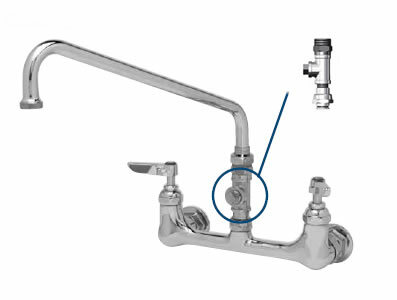 A backflow prevention device should be installed if it is not included with the accessory device.